With the strength of typhoon Glenda that entered the Philippine Area of Responsibility, the Malacañang announced the suspension of classes and works on all levels tomorrow, July 16, 2014. The said suspension of works and classes will fall under the areas that will be experiencing signal no. 2. To see what is stated in the Memorandum Circular No. 67 signed by Executive Secretary Pacquito Ochoa. It says that “Upon the recommendation of the National Disaster Risk Reduction and Management Council (NDRRMC) and in view of the inclement weather brought about by Typhoon “Glenda,” work in government offices and classes in all levels, both public and private, in the National Capital Region and in areas under Typhon Signal 2 are hereby suspended tomorrow, 16 July 2014." 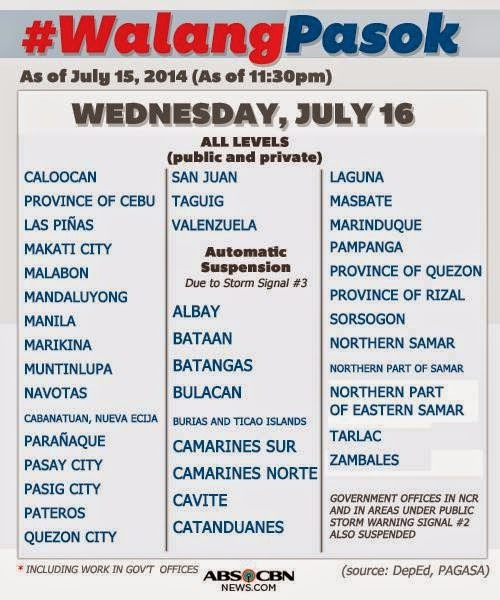 With the abovementioned memorandum, Metro Manila fits for the qualification of an area wherein classes and works should be suspended since the latest storm signal as of 11:00 PM of July 15, 2014 are the following. Signal No. 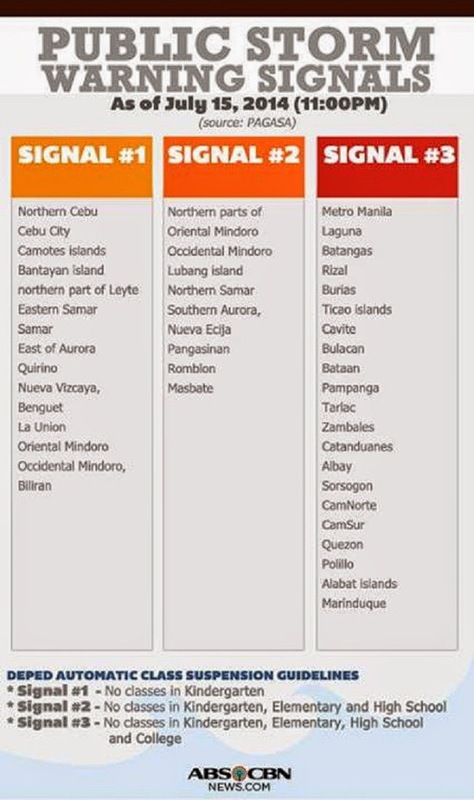 3 is raised to Metro Manila, Laguna, Batangas, Rizal, Burias, Ticao Island, Cavite, Bulacan, Bataan, Pampanga, Tarlac, Zambales, Catanduanes, Albay, Sorsogon, Camarines Norte, Camarines Sur, Quezon, Polilio Island, Alabat Island and Marinduque. Signal No. 2 is raised to Northern part of Oriental Mindoro, Occidental Mindoro, Lubang Island, Northern Samar, Southern Aurora, Nueva Ecija, Pangasinan, Romblon and Masbate. Signal No. 1 is raised to Northern Cebu, Cebu City, Camotes Island, Bantayan Island, Northern part of Leyte, Eastern Samar, Samar, East of Aurora, Quirino, Nueve Vizcaya, Benguet, La Union, Oriental Mindoro, Occidental Mindoro and Biliran. We have to see to it that we are well prepared for the coming of typhoon Glenda. Metro Manila is not just the area where the classes and works were suspended as it was also announced earlier in different provinces across the country that are affected by the typhoon.